Did you know that heart disease is the leading cause of death among women? In honor of National Heart Health Month, WomenHeart and Burlington have once again teamed up to support women’s heart health education and increase awareness for this chronic and life-threatening disease. To commemorate the third year of its partnership, WomenHeart and Burlington are pleased to announce the launch of their nationwide Heart of Style Tour. The mobile event will travel to select Burlington locations throughout the country to inform women coast to coast about heart disease as their leading health threat and empower them to take charge of their heart health. Heart health professionals will be on board to provide complimentary heart health screening, consisting of blood pressure and Body Mass Index tests, as well as a risk factor questionnaire. Hispanic educational materials will be provided by WomenHeart Champions, heart disease survivors and community educators. For more information and to see if the tour stops in your city, check here. In addition, now through March 31, customers are invited to help raise money to build awareness for heart disease as the leading cause of death in women and to support women living with heart disease. Customers can purchase a red dress icon for $1 or more at check-out at all Burlington locations to benefit WomenHeart and their mission of furthering to educate women on the importance of their heart health. Also, for every dress purchased during this time period at all Burlington locations, Burlington will donate $1 [up to $25,000] to benefit WomenHeart and fund life-saving heart health education. As a thank you, customers will receive 20% off their purchase at 1-800-Flowers.com. 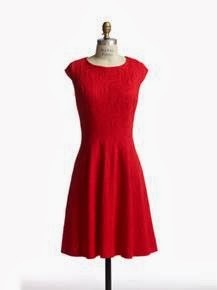 Lastly, in honor of National Heart Health Month and with Valentine’s Day just around the corner, Burlington has you covered with a large assortment of red dresses available whether you’ve got a hot date or girl’s night out on the town coming up! See below for just a couple of the many red dresses available at Burlington – all under $50!